This memoir by Oliver Sacks' lover until his death, felt more approachable than Sacks' own memoir. I didn't get very far in On the Move, because the hard-core, motor-cycle loving adventurer portrayed seemed mismatched with the eccentric, endearing and shy person he was later in life. 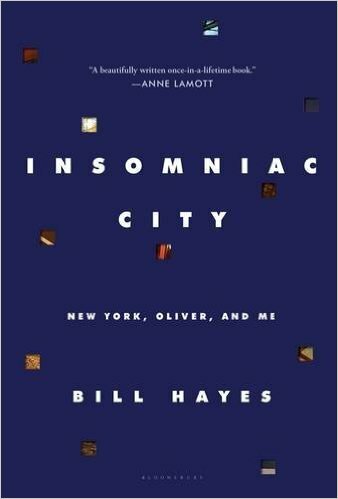 Insomniac City is not an exposé, but a respectful description of a man he loves. Hayes hasn't just written about Oliver, but also vignettes of life and New York. His deep affection for Oliver is counterbalanced by his appreciation for random people he meets in the streets and subways of New York. I love that this is what he builds his community out of. He snaps photos of people (with their permission), and also chats with them, getting glimpses into their lives. His portrayal of life in New York is filled with compassion and beauty. At first, the book felt choppy. I wanted more of each vignette. Hayes would say he has hundreds of subways stories, but then end the chapter there. His journal entries seem like an experiment that is uncomfortable to him. As the book progresses, he sinks more comfortably into his narration. There are some choice gems that lift this memoir from charming to memorable: "O" wearing swimming goggles when he uncorks champagne for the first time or the way he invests objects with feelings all the while maintaining this attitude is ridiculous or making lists of all the elements not found in a body. My favorite photo among the many portraits, is one simply of Oliver's desk that has a nature of haphazard orderliness. In the end, as in the beginning, I found myself wanting more: more process, more mourning of Oliver's death. Perhaps Hayes felt this was too private and therefore off-limits. But what is a memoir if not personal? Still Hayes has given us a glimpse into something sweet and special.